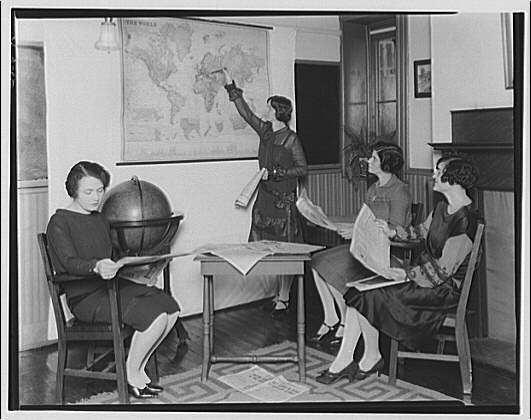 Fairmount School, 1711 Massachusetts Ave.
Women studying newspapers and map at Fairmount School 1920-ca. 1950. Accessing Inquiry for Students with Disabilities through Primary Sources. Meets 15-hour Massachusetts requirement for professional development on teaching students with disabilities. Earn 22.5 PDPs or 1 grad credit (extra fee applies) from Westfield State University. Directly supports content and Practice Standards of 2018 Massachusetts History and Social Science Curriculum Framework! Offered twice: Register. Oct. 24 and Nov. 8 – CES, Northampton. Oct. 10 – 8am – 3:00pm – EdAdvance, Danbury Connecticut. Note separate registration page. Integrating Civic Engagement Projects Across the Curriculum. How will YOU meet the new Massachusetts requirement to offer civic engagement projects? Learn the basics. Generate and test fly a specific action plan. Taught by national service-learning and civic engagement leader, Rich Cairn. Register. Oct. 4 and Nov. 28 – CES, Northampton. Jan. 23 and March 13 – CES, Northampton. Teaching Grades K-5 Civic Engagement and Social Studies. Examine new 2018 Massachusetts History and Social Science Curriculum Framework and develop plans to align your curriculum. Access a wealth of primary and secondary resources. Led by veteran K-5 teacher Laurie Risler. Register. Oct. 16 and 25 – CES, Northampton. World Geography and History: Designing Grades 6-7. Gain content knowledge in World History and Geography. Unpack, examine, and align courses to new History and Social Science standards. Offered twice. Register. Nov. 15 and Dec. 6 – CES, Northampton. Jan. 29 and Feb. 5 – CES, Northampton. Robert Lansing Papers – writings and reflections total 600 pages of diary entries, reflecting key interactions between Woodrow Wilson and his cabinet members regarding importance decisions during WWI. Five Questions with Tamara Rorie, Braille Officer, National Library Services (NLS) for the Blind and Physically Handicapped – Tamara work as a liaison between various sections of NLS as they interact with our braille products.